What is Man & Van Service? Our experienced delivery partners will deliver your item to your room of choice, unwrap it, place it into position and will also take away any unwanted rubbish. Please note that our delivery partners are not insured to fix anything to the wall. What are your delivery options for turnkey projects? Timeframes will vary according to whether the items are in stock or made to order. You will receive an email within 2-3 working days of placing your order with your expected delivery date. Upon dispatch, our couriers will email you a tracking number and you will then be able to track your order online. Not currently however, please contact us and we will try to assist. We are sure you will love your purchase. 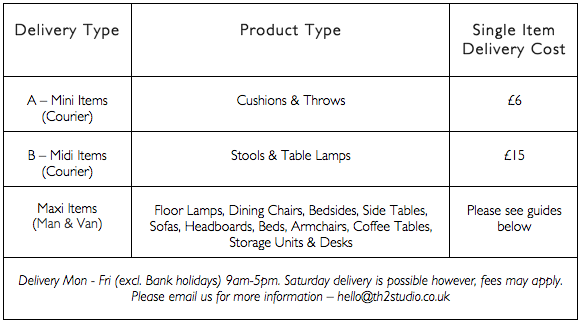 However, if you wish to make a return, we offer a 14 day returns policy on all of our items. All we ask is that you return the item in its original condition. We will process your refund within 14 days of receiving your return, providing it meets our return policy guidelines. Please note that we do not refund the initial postage cost. What if my order arrived damaged/faulty? We carefully inspect each order prior to shipment however, in the unlikely event you have received your item damaged please email us straight away with an image of the fault and we will organise a replacement at no additional cost. You can find our full returns policy on our Terms & Conditions page.